U.S. Secretary of State Condoleezza Rice said Monday that Mideast peace talks are "moving in the right direction" although she warned Israel that it should stop new settlement activities that could upset progress. 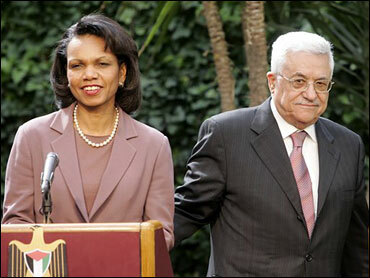 Rice's comments came after she held talks with Palestinian President Mahmoud Abbas at the end of a three-day Mideast mission with the goal of achieving an agreement before President Bush leaves office next January. Earlier Monday, Rice met separately with both the Israeli and Palestinian negotiators in Israel and said that she was impressed by the seriousness of their work. "I think it's all moving in the right direction," Rice said at a news conference with Abbas, saying that things are proceeding toward the goal of reaching some sort of peace agreement by 2009 that would lead toward the creation of a Palestinian state. "I fully believe it is a goal we can reach," Rice said. Asked, however, about Israel continuing to approve construction of new housing in contested territory, Rice criticized the close U.S. ally. "Settlement activity should stop - expansion should stop," Rice said. Israel has approved the construction of almost 1,700 homes in contested territory since renewing peace talks with the Palestinians at a U.S.-hosted summit in November, an Israeli watchdog group reported Monday. Although the survey contained little new information, Peace Now said Israel was undermining negotiations by repeating one of its "worst mistakes" - building on disputed land while holding peace talks. The U.S. has been urging Israel to halt construction in east Jerusalem and the West Bank, areas that Israel captured in the 1967 war but are claimed by the Palestinians for a future state. Israeli construction projects in the disputed areas have sparked a series of crises in the peace negotiations, prompting the Palestinians at one point to suspend negotiations. In its report Monday, Peace Now said Israel's Defense Ministry has approved plans to build 946 homes in the West Bank since last November's peace summit in Annapolis, Maryland. Peace Now said the government has also given final approval for at least 750 homes in east Jerusalem since talks renewed. Israeli Prime Minister Ehud Olmert denied that West Bank building had been stepped up. "All the reports of dramatic construction projects in the (Palestinian) territories are not true, and it's not true that we're building in violation of commitments that were made," Olmert told a meeting of his Kadima Party. Olmert also said Israel would continue to build in east Jerusalem and in heavily Jewish areas of the West Bank that Israel wants to keep in a final peace agreement. "This is going on within the framework of negotiations, and the negotiations will continue to progress," he said. An additional obstacle clouding negotiations concerns captured Israeli soldier Gilad Shalit. Hamas leader Khaled Mashaal said Shalit is alive and being well treated, CBS News correspondent Robert Berger reported. Shalit was kidnapped from his army base on the Gaza border nearly two years ago. So far Israel has refused to meet Hamas's price for a swap: more than 1,000 Palestinian prisoners in exchange for Shalit. While Israel has carried out lopsided prisoner swaps in the past, this one poses a dilemma. Hamas is demanding the release of top terrorists responsible for deadly suicide bombings, Berger reported.